I can’t remember the movie(s) but I do remember hearing anecdotes about weird experiments with victims of the guillotine. Specifically, trying to see how long one could keep a head alive once it was separated from the body. Well The Chirurgeons Apprentice tracks the rumor down and finds the truth behind it. It’s kind of creepy. A long time ago, I lived in an apartment and I just wasn’t able to own a dog. 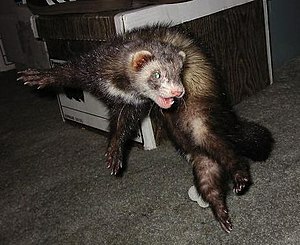 I did, however, really want some sort of animal in my household and so I took in a ferret. Eventually I had a small group of three of them and they really are great pets. More social than cats and almost as trainable as dogs, I would continue to be a ferret owner if their life spans were not so short (about 6-8 years). In any case, recent research has indicated that ferrets are just about equal to dogs in terms of picking up social cues from humans. It is assumed that this is the result of selective breeding, probably for other, specific traits, with the resulting side effect of greater social-cognitive skills. Speaking of dogs, some Samurai dude in the 19th century decided to outfit his dog with a special set of armor.